Observers are saying Emmanuel Macron's election as president of France is a victory for Europe. The election was not close. Macron received 66 percent of the vote compared to Marine Le Pen's 34 percent. The president of the European Commission congratulated Macron on Twitter. "Happy that the French have chosen a European future," he tweeted. A spokesman for Germany's Chancellor Angela Merkel called the result a "victory for a strong and united Europe". Le Pen, the National Front candidate, had said during the campaign that she would withdraw France from the European Union. She also opposed open immigration policies and called for tough measures against terrorism and crime. The final, run-off election took place two weeks after 11 candidates competed in the first round of the presidential election. For the first time, none of France's traditional parties were represented in the final vote. Socialist President Francois Hollande chose not to seek another term in office. Macron served in Hollande's Socialist administration. But he started his own movement called En Marche! last year. Ben Haddad, a French analyst with the Hudson Institute in Washington D.C., says the 39-year-old president-elect represents a number of firsts for France. 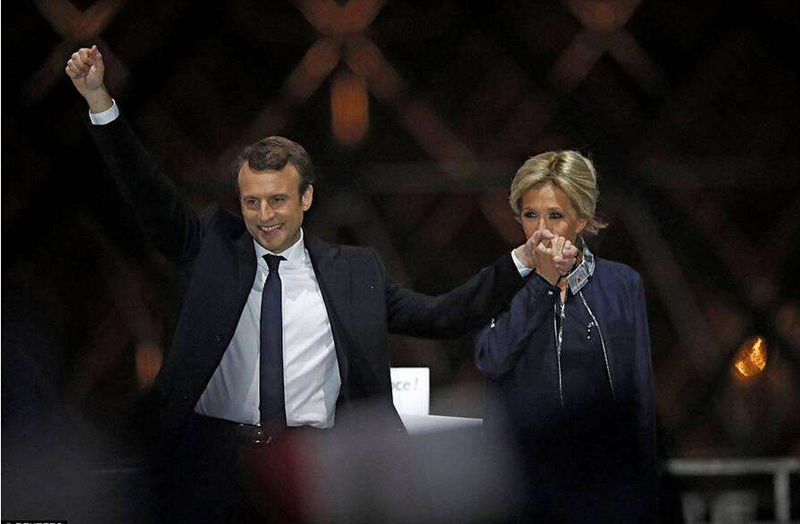 "This is the youngest French president ever who was virtually unknown three years ago, created his own movement from scratch just a year ago, and is winning in (a) landslide with an optimistic, reform-oriented, pro-European, liberal message." Haddad told VOA that the election showed that the two main political parties in France did not find public support in this election. He said French voters are expecting something new. Macron has called for reforms to France's economy including its job market to deal with the country's high unemployment. He also called for reform of the EU. However, he will need to build support in the French legislature where his movement currently has no representation. Macron has no experience as an elected official. Macron, however, has strongly supported the EU. European officials considered the French election very important because of Britain's vote to leave the EU in June 2016. France is a founding member of the European Union and is the second largest country remaining in it after Germany. If France left the EU, it might signal the end of the huge multinational organization. The vote brought to an end one of France's most divisive presidential campaigns. Marine Le Pen quickly conceded the election on Sunday. But, she promised to continue efforts to get voters to fight globalization and an open immigration policy. She promised to oppose the new president's policies in the upcoming elections for the legislature in June. Le Pen led the National Front, a conservative party started by her father. In Sunday's vote, she received a little more than one third of the votes cast. However, she received a much higher percentage than her father Jean-Marie Le Pen who ran for president in 2002. Marine Le Pen ousted her father from the National Front because of his extreme views. During the campaign she stepped down as party leader in an effort to increase her appeal. Fewer voters took part in the election than expected, possibly because of anger over the combative campaign and traditional politics. French officials said 4 million people submitted blank votes. Although Macron has won a big victory, he still faces critics both inside and outside the country. Britain's Nigel Farage led the campaign to leave the EU in his country. He said Macron's victory will guarantee that Le Pen will win in the next election in 2022. He said the French are not ready to leave the EU, but one day they will. How is it possible that there were no blank votes? The third advantage is an immigration policy that, historically, has been fairly open. Commodity shortage, a problem constantly obsessing the Chinese, has been basically brought to an end. 1.During the campaign she stepped down as party leader in an effort to increase her appeal. I stepped down from the tomb and said thank you. Our boss stepped down after thirty years with the company. 2.During the campaign she stepped down as party leader in an effort to increase her appeal.